Difficulty in getting Volunteers to cooperate with Hospice increasing regulations for Annual Mandatories, flu shots, additional Annual Training in Alzheimer's. Any ideas on how to handle this? We have such high expectations for staff and volunteers when it comes to being completely aligned with our organizations. We want to better the world and the lives of others through our work. And, for the vast majority of participants, that is accurate. But then there are those few volunteers whose behavior is problematic, who don't seem to get along with others, who seem to provide feedback in an inflammatory or negative manner. These volunteers really make it challenging for everyone involved to stay focused, positive, and engaged. And we often refer to these issues as conflicts because of how they feel, even though they may not technically be conflicts at all. Our roles in engaging and motivating volunteers while managing tough situations can be difficult. I should know. While serving as Chief Program Officer at a highly influential Girl Scout council, I created the Volunteer Conflict Management System™ out of sheer necessity (and a smidgen of desperation). I analyzed my day-to-day volunteer conflict interactions, called upon my mediation background, took a page from my Human Resources Employee Relations experience in the corporate world, and joined them together to produce a system that addresses every kind of volunteer conflict. In this article, I will provide both the core steps to prevent conflict issues from occurring and links to even more information. 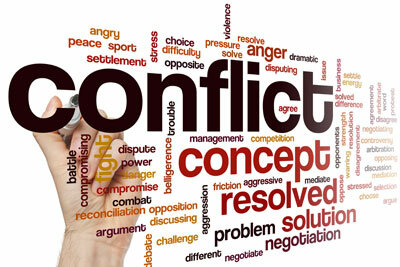 There are many reasons conflict occurs. Sometimes, volunteers have other agendas. Or, the mission may be in their hearts, but their actions may cause issues for others around them. True conflict: You get a report that Ms. A and Mr. B are arguing again in meetings and in front of others. These two just don't seem to be able to get along and their differences are affecting the work and have become noticeable to others (both people appear to be participating equally). Volunteer behaving badly: Mr. C has had a harsh tone with others and there was a report of him shouting at someone during an event. (Mr. C has exhibited this or similar behavior in other reported instances as well). Volunteer breaking a procedure, possibly doing something illegal: You get a report regarding suspicious actions in the handling of money, materials, or valuables on the part of Mr. D. The person reporting the alleged issue has made it clear that she will not speak on-the-record, only anonymously to you. Toxic Volunteer: Ms. E has a long-standing relationship with the organization and is not pleased with (fill in the blank: organizational direction; policies; leadership...). She will provide you with a ton of feedback, but few practical or realistic suggestions for moving forward. She is very public with her negativity and displeasure, all the while pledging her great love for the mission of the organization. (You know who this person is ... you can probably name him or her right now). More on the Toxic Volunteer later. Let's take a look at the overall view of volunteers in your organization. This will lay the groundwork for all else that we do from here. While there are many ways to think about volunteers, two areas rise to the surface: Does your organization have enough volunteers and are they providing quality services? Which of the following best describes your organization’s current view of volunteers? Qualified Abundance: We have plenty of qualified volunteers to help us with our mission. Adequate Numbers/Imbalance of Quality: We have enough volunteers, but wish many would perform at a higher level with less guidance and intervention from staff. Scarcity of Numbers/Imbalance of Quality: We never have enough volunteers. Because they are always scarce, we tend to take on (and keep) volunteers even if they are problematic or not a perfect fit. If you chose the Qualified Abundance category, congratulations! You are in the perfect position to create, implement, and follow-through with swift and healthy conflict management. Having more than enough qualified volunteers places you in a position of never feeling afraid to reprimand a volunteer or forced to retain a volunteer who no longer aligns with your organization. If you chose the Adequate Numbers/Imbalance of Quality category, you've already poured a good deal of resources into training the volunteers you have. The prospect of starting over with new volunteers may be more overwhelming than accepting the less-than-perfect quality level of your current volunteers. Focus on setting expectations for the volunteers that you have and providing them with even more training on those expectations. The Scarcity of Numbers/Imbalance of Quality category is by far the most challenging place to be. Constant fear regarding volunteer head counts may cause you to be hesitant to correct or release volunteers. You must regain and retain perceived control by implementing the strategies outlined in this article. We each have a dominant, natural style in response to conflicts that are A) in the form of direct confict, meaning issues directed AT you; or B) in response to conflicts being delegated TO you. I react to an initial report by stepping in to solve it and provide a final answer. I push conflicts back to the volunteers with instructions that they are to resolve them on their own. I pass it to another staff member, who either has more authority or some special skill with volunteers that I don't possess. I need to sit on it for awhile to figure out what to do. None of these four positions is going to be clear, proactive, or final in resolving the conflict. If you chose Response #1 (the react and step in to solve response,) your actions may be too much, too soon. Have you heard all sides of the conflict in reaction to the initial report? Staff: WHAT!? She did what? Oh, no, that is so wrong! Oh, I can't believe she said that to you! Staff: Oh, no. That is not acceptable and I will take care of this immediately. Please be assured that we take this very seriously and will take immediate action to ensure that this does not occur again. Thank you for your report. And you are off and running without even speaking to the “accused” party to get her side of the story. This can get you into even more trouble later. If you chose Response #2 (you push conflict back to the volunteers to solve), that may be an appropriate response but only IF it is a True Conflict. 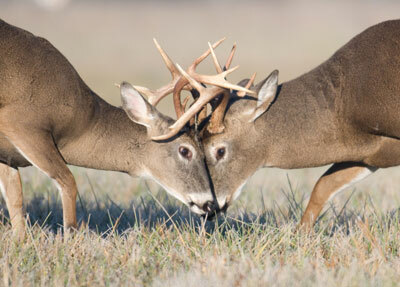 True Conflict is where two people are in disagreement with one another, but are not crossing any behavioral boundaries or breaking any procedures. If you selected Response #3 (to pass conflict to another staff member), that may be appropriate depending on the reported situation specifics and the parties involved. But ask yourself if you are doing so because of your own lack of confidence with taking action or because you may be unclear about conflict policies. That leaves Response #4 (sit on it for a while). Wouldn't it be great if while you were sitting on the report, the conflict just “disappeared?” If it appears to have gone away on its own, don't be fooled. It didn't. It just went underground, and when it reappears it will be bigger and uglier than before. To learn more about your approach to handling conflict, take the free online “Conflict Styles Assessment” quiz offered by the United States Institute of Peace. Get ready to create an iron-clad conflict management process. First, make your conflict management process specific. At this point they are not looking for a mutual solution, and self-resolution will not occur. Make it easy on yourself and other staff by spelling out as much as you can about your conflict management process and any consequences that may occur if volunteers attempt to opt-out of participating in the process. The process must be designed to address the three most common conflict types: True Conflict; Volunteer behaving badly; Volunteer breaking a procedure. Let me show you an example of a robust conflict management process that is proactive, clear, and final. 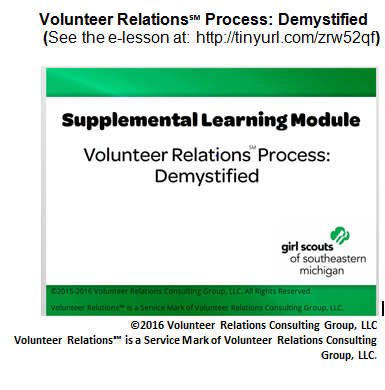 It is an overview of my Volunteer Conflict Management System℠, as represented by of one of my clients, Girl Scouts of Southeastern Michigan, to their volunteers in the form of an e-Learning module. Implementation of The Volunteer Conflict Management System℠ incorporates the overview as shown in the slide show. It also includes the tools needed to respond to complaints/issues with empathetic neutrality and to process complaints by engaging all parties without judgment. Once you have created your conflict management strategy, make sure it is easy to find and understand your strategy documentation. Here’s a tip: Ask a newer staff member or someone from another department to locate and review every reference to your current conflict management documentation. Then ask them to attempt to poke holes in the interpretations of the language. Because you already know the rules, it's harder for you to see that the language may not be clear enough or may be misconstrued by others. Distribute your documentation in every manner possible for your organization, and provide an individual copy to each volunteer. Otherwise, use digital to its fullest by publishing the documentation on your website and/or providing it via email as a PDF secured as non-editable. Documentation Bottom Line: When a volunteer goes outside of a policy, rule, behavior, etc., you MUST have the documentation to defend the organization's position. If it isn't written somewhere, you will have great difficulty enforcing it. Volunteer training is your foremost opportunity to present your conflict management procedures directly to your volunteers. What's that? They won't attend training? Although certainly not optimal, that's OK, because you have the process documented and available in case of a breach. If the volunteer states that you have not instructed them on the process, on the contrary – there it is in black and white, or on video, or on your website, or all of the above. Be sure to include the stipulation that participation in the conflict management process is non-negotiable; it is part of the volunteer’s implied contract when signing on as a volunteer. I know that this article is about conflict. The actions of a Toxic Volunteer look and feel like conflict but they really aren’t. The individuals (although they like to band together in groups, too) who have a gripe or series of gripes, and their persistent negative and very public vocalizations, are ultimately harmful to the organization. The Toxic Volunteer is not in true conflict with another individual; he/she is in conflict with the organization as a whole. They openly ignore current rules and programs and intentionally proceed without aligning to organization norms. They badmouth the organization to other volunteers (they will tell the other volunteers how the policies/training/rules/paperwork, etc. are poor or stupid). They will attempt to justify their positions by bullying others to align with them, rallying the troops. They think that if they get enough other volunteers to complain or to ignore the mandates, they will get their way. They will scare away newer volunteers with their venom. A new person comes in full of hope and excitement. The Toxic Volunteer will zero right in on that person to tell him/her all the things that are wrong with the organization and how hard it is to be a volunteer. You can practically see the outline of the new volunteer’s body as he/she crashes through the door, not able to get out fast enough. Results of a Toxic Volunteer’s deeds include decrease in membership and participation, with people leaving in droves without telling you because they don't want to be a target of this toxic individual. Why do we tolerate the Toxic Volunteer? This is where we return to the start of this article. If the organization fears volunteer scarcity, we feel trapped. And if the Toxic Volunteer has influence and connections with other volunteers, in the community, or with board members, we worry that our feedback might offend and the Toxic Volunteer will pass that around in a negative way. So we let the Toxic Volunteer call the shots. Remember, your focus should always be on the greater good of the organization and those served. Don't let the Toxic Volunteer make you veer off course. Is the volunteer's behavior good role modeling for those you serve? Is your action/inaction towards conflict doing what is best for others you serve? Is the staff time spent on volunteer conflict a good use of time and funds provided by your members/donors? Does a Toxic Volunteer's actions ultimately help or hurt your mission? When you look at the ultimate harm that is caused by volunteer conflict, you will see that the steps provided here are well worth the effort for your own health, your staff's health, and for those you serve. agree with Maria - motivation. However, what about emphasising organizational expectations at the beginning of the recruitment and selection process ?